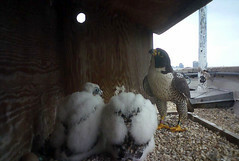 Was watching the South Loop cam this afternoon and saw a feeding. We are banding these two tomorrow and they are just the right age. Both the chicks were sitting back on their tails while Helen fed them, so they seemed a little smaller than her, but if they were standing all the way up, I think the larger of the two chicks would be about the size of their mother. We are also banding Pilsen tomorrow. We don’t have adult IDs there, so I’m excited to get that info. Evanston is Thursday, but I’ll miss that one because I have to stay at the museum and work. Friday is the river birds and Saturday is Millennium Park. Next week is packed too. Then, we will have a bit of a break before our late bloomers are ready at Wrigleyville, Wacker and UIC. ~ by Steph on May 28, 2013.